The beautiful, the wonderful and the Crazy Life of The Ozturks: Where was this place? Our friends Seyhan and Oguz met up with us in Madison Square Park this past Thursday to share a bit of halal gyro and get the kids to hang out in the playground. They mentioned this place in Soho that had great rice pudding so we thought, Hmmm....new place! Let's try it out. It was amazing! The first flavor I tested was Man-Made Mascerpone and it was exactly what I loved in the itty bowls we used to get in Lahore, Pakistan. The rice pudding in those clay bowls would be so thick that it wouldn't detach itself even with the bowls all stacked upside down! As we were enjoying the gumpy goodness, Oguz breaks the news that he knew about this place since 5 years ago. It's been here for 5 years? Worst of all, I've known you guys a total of 22 months and you've brought me here NOW? What? I wasn't GOOD ENOUGH to share this with? 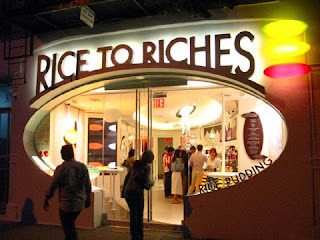 I think they owe me a bunch of treats at Rice to Riches. Which would be a good thing, because I'm hooked and they're kinda on the expensive side.